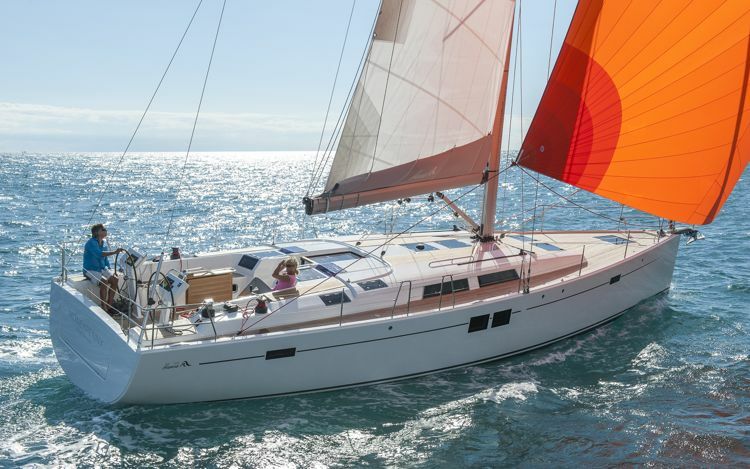 The Catana 53 is still on the drawing board, but this sailboat is already getting attention. 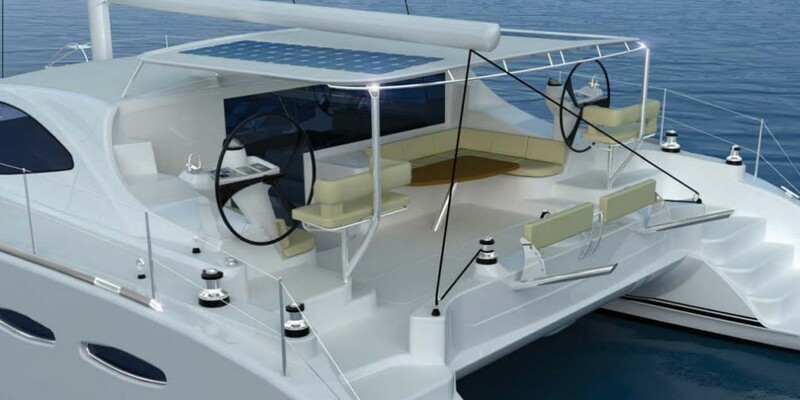 Catana Catamarans is in the process of building their latest design, and it will be tucked between the existing Catana 47 and Catana 59. The new 53 will take the place of the previous 52, and with its lighter carbon-infused sandwich construction and sleeker hull shape, it’s bound to live up to the French builder’s reputation for making fast cats that make tracks. 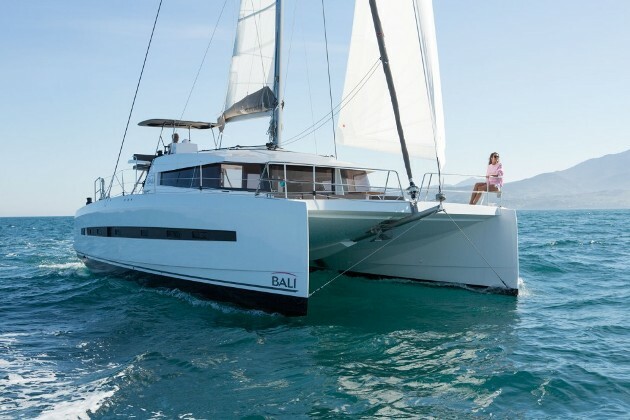 Many sailing catamarans are made for space and comfort, but Catana also puts an emphasis on performance. 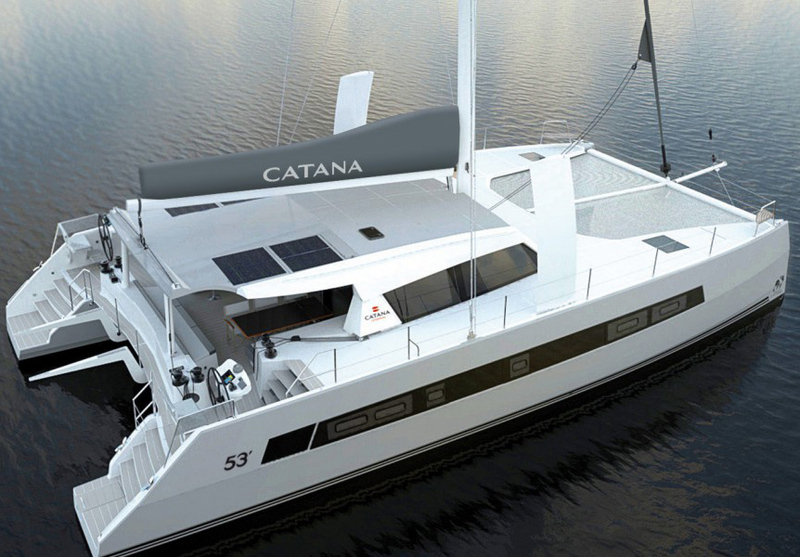 Catanas are catamarans built for sailors. Yes, there’s still the advantage of acres of interior living space and the enormous cockpit, but a cat can be much more than spacious. Catanas enjoy a reputation for being fast and tough so they can cross oceans with ease and the new 53 will be no exception. 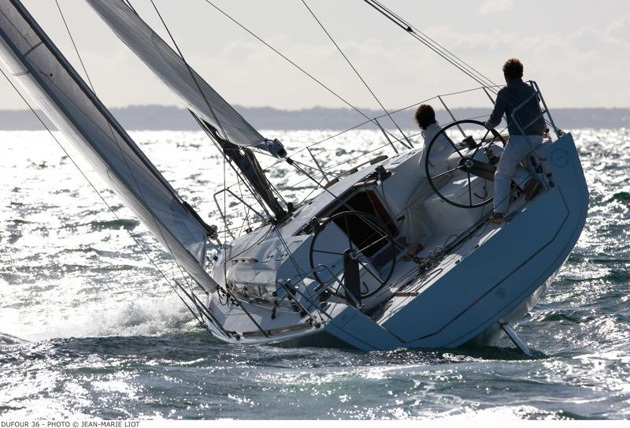 The reverse-angled bows are shaped to slice through waves rather than pound down on top of them, and the curved daggerboards will add a bit of upwind performance, the point of sail that's always challenging for a cat. Racing fans will recognize these two design elements as they’re reminiscent of features on America’s Cup racing cats. With the boards up, the 53 will get into skinny water of less than five feet. But with them down to almost 12 feet, the 1,776 feet of sail area will make this cat roar. 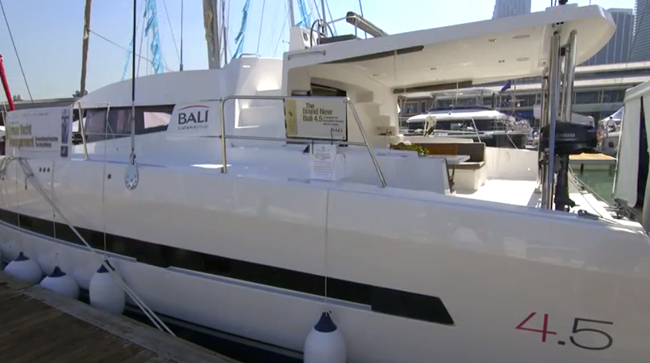 Inside, the minimalist décor keeps the lines clean and the spaces efficient, but there is an upscale vibe that says this is a luxury boat. A dinette seats eight and shares a seat with a sizable forward-facing nav station. The galley to port is drawn with good countertop space and multiple fridges. 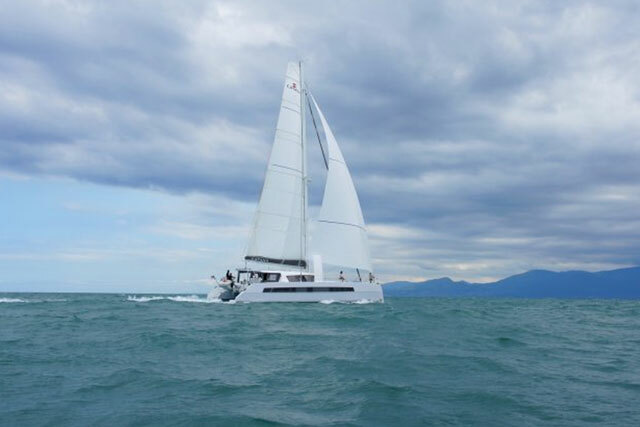 The Catana 53 will come with four heads and four cabins or three staterooms (with the master occupying most of the starboard hull) and a separate crew cabin with over/under bunks and its own access via the foredeck. The cockpit is on the same level as the main saloon, providing a convenient flow in an easy indoor/outdoor lifestyle. Sail Area 1,776 sq. ft.
As on all Catanas, the twin helm stations will be far outboard, positioned on each hull, which is a mixed blessing since it limits visibility forward to the opposite bow from the helmsman. Some will love it, others will not, but it’s a feature that keeps with the design of all Catanas built to date. 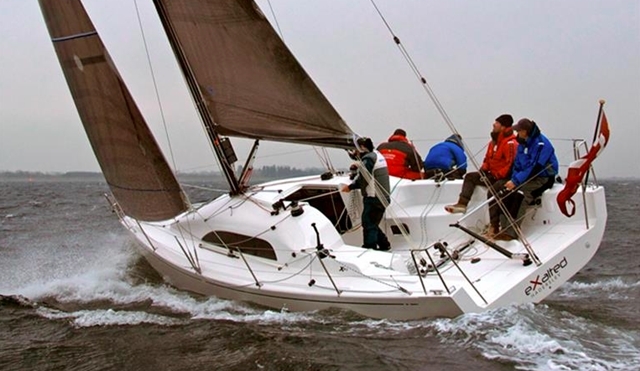 Expect to see the first hull on the water in Europe in 2016. U.S.-bound models will make their debut most likely in 2017. 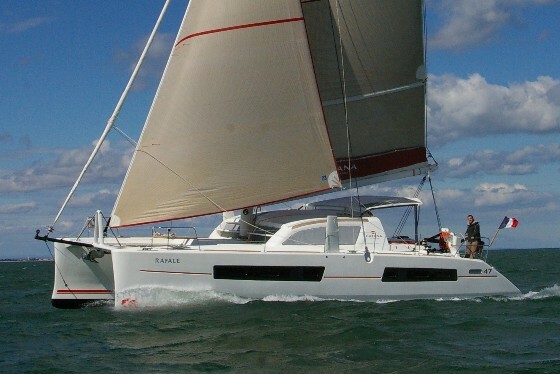 The expected price is 1,200,000 Euro (about $1.35 million) plus delivery and commissioning. The dollar is strong against the Euro, making this cat a deal for early American buyers.